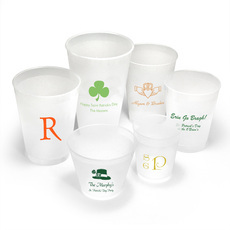 Personalized shatterproof frosted cups are available for many types events. Our confetti dot designs offer many options ideal for almost every type of celebration. These cups are reusable and top-rack.. 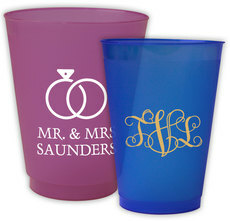 Cheers to the happy couple with personalized frosted shatterproof disposable or reusable cups. 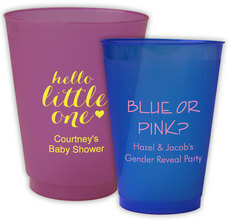 Personalize with an anniversary design, the couple's names and wedding date, their monogram, number of..
Fun confetti dot designs show off your message on personalized colored shatterproof frosted cups. Our confetti dot designs offer many options ideal for almost every type of celebration. 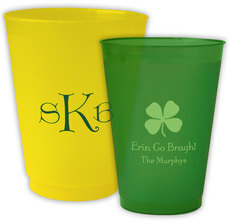 Cups are..
A must-have for any Irish pub party or St. Pat's Day celebration. 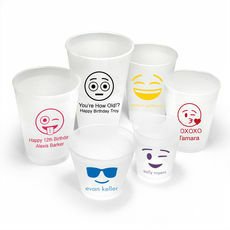 These disposable or reusable personalized shatterproof frosted cups are ready for your favorite cold beverage. 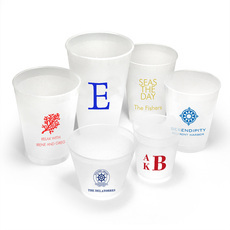 Top-rack dishwasher..
Fun personalized disposable or reusable shatterproof frosted cups are perfect for the beach and boat. 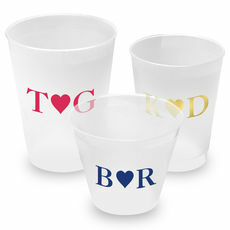 Personalize with your boat's name, a nautical logo, monogram or fun phrase. Top-rack dishwasher.. 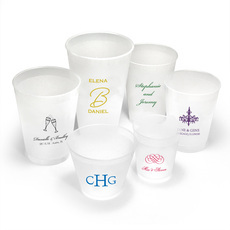 Cheers to the bride-to-be with personalized disposable or reusable shatterproof frosted cups. 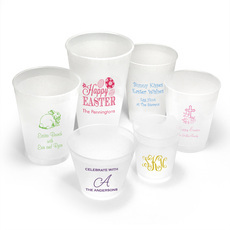 Personalize the cups with the Bride's name, a cute bridal design, the Bride's new monogram or a cute..
Personalized shatterproof frosted cups will make your next special occasion very special indeed! These cups are reusable and top-rack dishwasher safe. 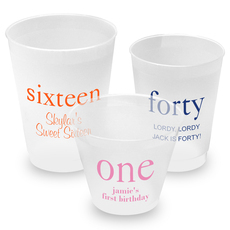 Your choice of typestyle, ink color and size of..
Make you upcoming special occasion even more special with personalized cups ideal for your cold beverages. They are ideal for your upcoming anniversary celebration, wedding, rehearsal dinner party or..
Set of shatterproof frosted cups with two initials surrounded by our adorable heart design will be loved at your upcoming anniversary party, engagement party, rehearsal dinner, bridal shower or..
Our personalized disposable or reusable shatterproof frosted cups are perfect for baby showers. 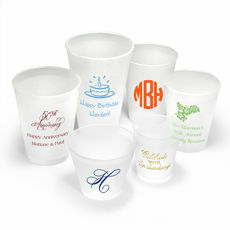 Personalize them with a cute baby design, the new baby's name, the baby's monogram, etc. 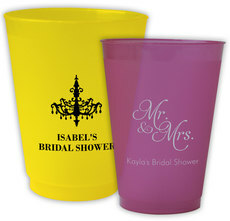 Top-rack..
Make you upcoming special occasion even more special with personalized cups ideal for your cold beverages. 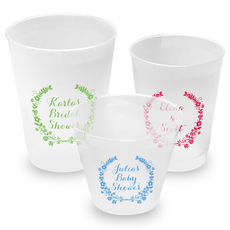 Our floral laurel wreath design is a pretty backdrop for your custom wording for a birthday,..
Personalized disposable or reusable shatterproof frosted cups are perfect for your wedding bar, rehearsal dinner, engagement party beverages or bridal shower. Many bridal and wedding designs to select.. 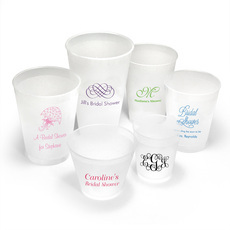 Cheers to the bride-to-be with personalized disposable or reusable shatterproof frosted cups! 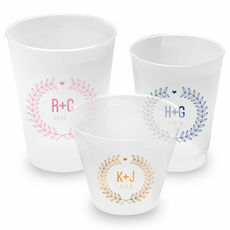 Personalize the cups with the Bride's name, a cute bridal design, the Bride's new monogram or a cute..
Our lovely frosted personalized plastic cups make your entertaining very special. These cups are flexible, shatterproof, reusable, and are the perfect solution to easy entertaining. No glassware necessary when these cups are provided. 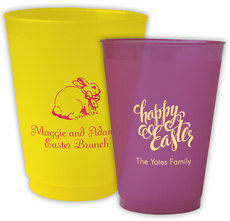 These cups are printed with a high quality screen printer, offering a unique frosted textured design, are top-rack dishwasher safe, are recyclable (#5-polypropylene), BPA Free, made & printed in the USA. We offer many designs and monograms to make your personalizing easy. We also offer instant online previews of the imprint so you can be confident that your cups will be printed with the look and style you want. There is no extra charge for 2-sided imprinting. 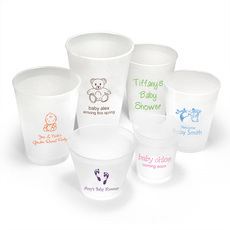 We also offer personalized frosted cups with your artwork or logo. There is a cup size perfect for every beverage you are offering. They come in 5 oz., 9 oz., 12 oz., 14 oz., 16 oz., and 20 oz. sizes. Take into consideration how much you want to pour so you order appropriately sized cups. Cups used primarily for cocktails and wine would be smaller than cups used for lemonade, iced tea or beer. 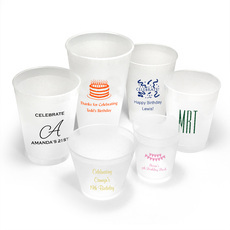 These cups will be perfectly personalized and will elevate the look of your celebration. They are ideal for wedding bars, your rehearsal dinner bar, bridal showers and baby showers for punch and drinks, birthday parties, graduations, holiday events, home bars and more. They are also fun to use at a dessert table for ice cream sundaes or at a dessert bar. It's great that these are reusable but they are also cost-efficient enough to be disposable. They are elegant enough for a formal event and also perfect for the more casual celebrations. 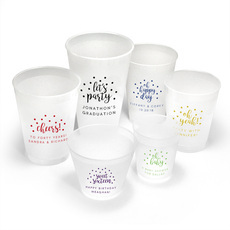 These shatterproof flexible frosted plastic cups are the perfect solution to your entertaining style.